Are you struggling with having enough home storage and staying organized? Learn how to double any space with effective organizing solutions! Organization is great, but sometimes it can feel like we just don’t have the space we need to really get it done. It’s easy to overlook one of the best aspects of organization, and that’s the huge space savings it can provide! 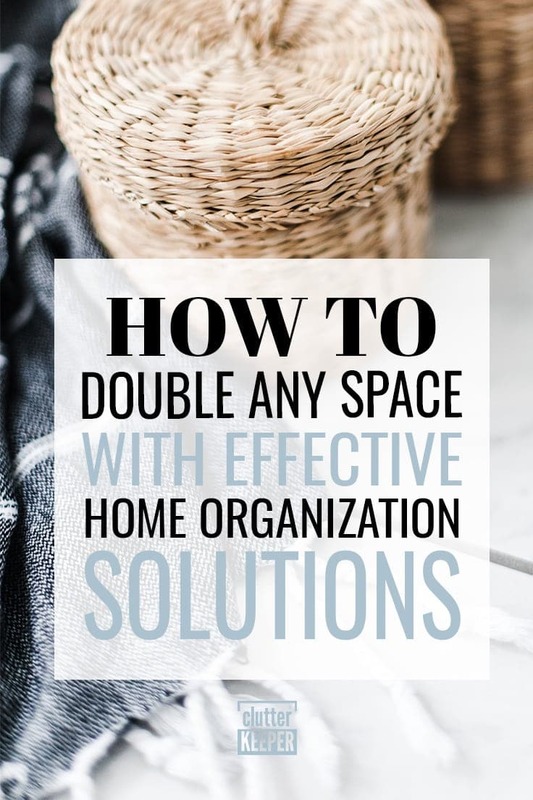 If you’re struggling with space constraints but want to get organized, here’s how to double any space with effective home organization solutions! 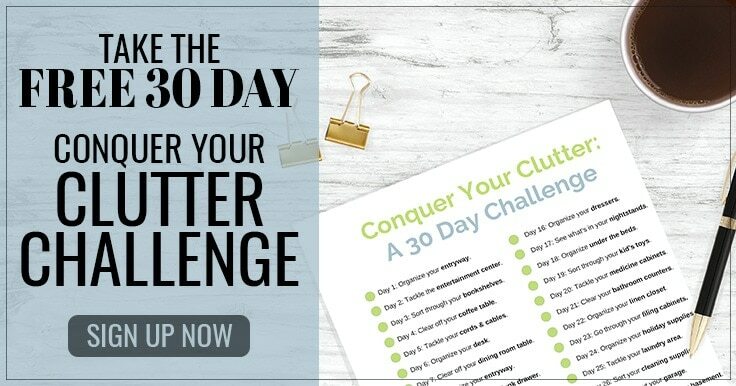 These ideas are incredibly easy and free up so much space. In fact, you might just double your storage space. Living in a small home can be tough for home organization. You just don’t have storage space. Follow these tips and you’ll discover storage you didn’t know you had. One thing you will notice as you begin organizing your small house, is that you probably have more things than you actually use. Throw away or donate anything that you don’t use, or that doesn’t add anything to your life. Now, let’s get into the best home organization solutions that will give you double the space. The very first home storage tip is to roll your clothes in your drawers. If you store clothing folded up in drawers, try rolling them up to save some space. Rolling clothing allows you to set them on their side vertically and pack a bunch of rolls next to each other, maximizing your storage capacity. This tip is also perfect for traveling, as it lets you pack more in the same amount of space. Because clothing is a soft material, it can be compressed and reduce the amount of space it takes up. Rolling takes advantage of that more than folding does, giving you more room in your drawers without upgrading them! What is the best way to roll your clothes? Abby from Just a Girl and Her Blog has a fantastic tutorial that shows how to roll shirts and pants to free up space. Next of the home organization solutions is to sort items by size. For solid items like bottles, cans, tubes, or anything else try storing them by size, keeping similarly sized items together. Doing this allows you to better fit items together and plan for the remaining space you have. The more you are able to plan and sort, the better you’ll be able to organize and the less space you’ll need. A good example of this is cereal boxes in a pantry, keeping boxes according to size, you’ll be able to find what you need quickly and keep things organized. Third, organizing effectively means using every bit of space you have without waste. When thinking about how to organize a drawer or other container, try to eliminate space between items as much as possible. These little gaps may not seem like much individually, but when everything is packed a little tighter you’ll find you can suddenly store more than ever before! All space is storage space, so use it effectively for maximum benefit. One way to do this is to use drawer organizers or closet organizers. Don’t just cram things together, keep them easily accessible. Another way to double the storage space in a small home is to use drawer dividers. We all have that one drawer in our house. The one that is just filled to the brim with no clear purpose, full of things we can’t even remember. That drawer is the perfect example of why dividers are so great! Use dividers in any storage container to help break it down into smaller, more manageable sections. Doing this allows you to have more granular control over your organization, and make it easier to find a place for things that might not fit into broader categories. Additionally, think about how to use your vertical space effectively. Houses are measured in square footage, which can give you a rough idea of how much you can fit in it. But here’s the thing, that floor space reaches all the way up to the ceiling! Vertical storage solutions are everywhere and can easily double, sometimes even triple your total storage space. A popular vertical solution is hanging organizers for gift wrapping supplies or for organizing shoes in closets. Turn that huge pile into a neat, thin column and give yourself some breathing room! 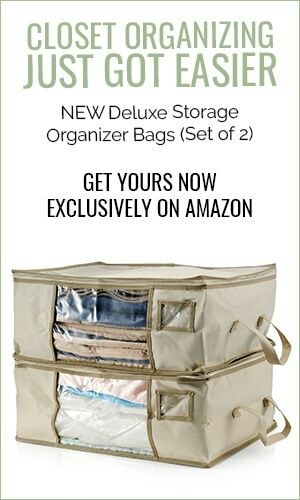 Another useful idea is to put extra blankets and seasonal clothes in large fabric storage bags. When they’re full, you can stack them vertically on top of one another. Then put them on the top shelf in your closet to make better use of that space or even store them under your bed. The final tip for effective home organization solutions is to combine things into bins or baskets. Sometimes loose items are difficult to contain on a shelf or loosely in a drawer. You will find so much more storage space if you use baskets to keep all these items together. An easy example is how to organize bathroom cleaners. Instead of a lot of loose cans and bottles taking up space, put them all in a basket or bin. You will be amazed at how much more storage space you discover when you gather loose items into a basket. If you own a lot of stuff, getting organized may seem like a far-off dream due to storage space limitations. Don’t let the size of your own home stop you from organizing! With these tips, you’ll not only be able to get organized, but you’ll even free up some space in the process. As you discover more storage space in your home, here are some articles that will help you organize it even better and keep it organized. Bedroom Organization – This is a complete guide. 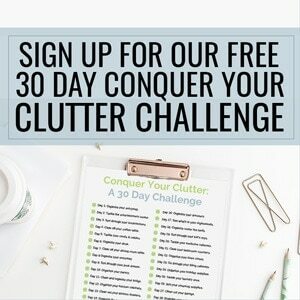 It explains how to organize your bedroom and solve common organization problems. How to Get Rid of Your Junk Drawer Once and For All – The easiest way to double storage space is to solve a big problem, the junk drawer. Bathroom Organization – This complete guide provides a ton of storage solutions for bathrooms of all sizes, from large to tiny ones.